Do you need help to increase Sunday School attendance? Why not offer gift shop credits, print off your vouchers here..
under 3 years of age. Sunflower Wreath Craft. A lovely craft to make to welcome Spring and Summer and celebrate the beauty of our world. Everything you need is included in the kit. Foam shapes are all self adhesive, so easy to arrange and make. Wreath measures approx 22cm. 50 Christian Snowflake Stickers. These stickers celebrate the beauty of winter and being unique and special. 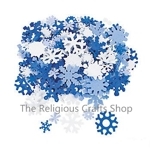 Each snowflake has a cross set in a glittery centre. Stickers measure approx. 4cm. Make the Creation Scene and Sticker Sheets - Pack of 12. 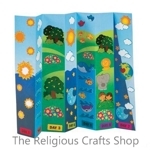 A fun and easy children's craft idea for even the littlest of believers, these sticker scenes fold up to display the 7 days of creation. Provided is the background A4 sheet which folds to make a 3D stand scene; with an A4 sheet of stickers for each day of the Creation. Stickers measure 2cm to 4cm. Sunday School 12 Pack of Foam Crafts. A great addition to Sunday School activities and crafts. 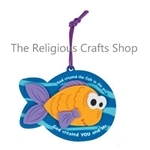 Each of these ornaments features a smiling yellow fish and text that reads �God created the fish in the sea. God created you and me�.Packs contain self-adhesive foam pieces and satin cord for hanging, so they are easy to make. All craft kit pieces are pre-packaged for individual use. Kits include instructions. Finished product measures approximately 10cm. Pack of 50 Motivational Animal Stickers. 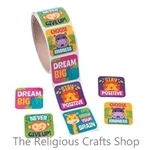 These colourful and bright stickers are bound to be popular with younger children. With their bold animal images and inspirational messages, these square stickers are ideal to give out at schools and Sunday Schools as rewards and treats. Stickers measure approximately 4cm. Pack of 50 Flower Stickers. 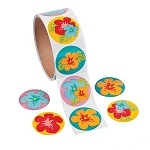 These stickers are colourful and have a range of flowers of different colours and designs. Stickers measure 38mm. 50 Cute Bunnies and Chicks Stickers. 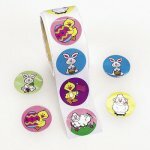 Children love these cute and colourful stickers and they are always popular at Easter. Stickers measure approximately 40mm. 1 Sheet of Snowflake Prism Stickers. 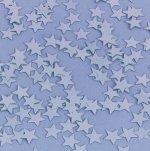 Glimmering silver snowflakes - perfect for Christmas cards and envelopes and decorations. 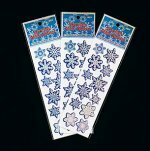 Each sheet has 12 assorted snowflake stickers, measuring between 2 and 3cm. Pack of 200 foam bug shapes. These are ideal for a wide range of Sunday school, home and school activities linked to nature. Bugs come in a range of designs and colours and measure approximately 3-4cm. 200 Foam Snowflake shapes. Keep a bag of foam shapes handy, as they are always useful when children are making pictures and cards. These snowflakes add a wintry touch to pictures. Snowflakes measure approximately 2cm to 5cm and come in shades of blue and white. Flower Foam Frames plus Self Adhesive Foam Shapes. Fun and colourful foam frames with 6 sheets of self adhesive foam shapes (1 sheet of each design). Nearly 100 shapes to arrange and stick on a frame to decorate and personalise. Easy to make and lots of fun too! Frame measures approximately 19cm with the space for the photograph measuring 9cm. 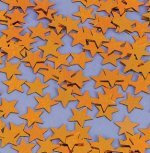 Gold Star Confetti - 5g bag. An essential for decorating Nativities and Christmas scenes. Always useful to have some stars to hand to make children's work special. Approximately 1cm in diameter. 5g bag of silver stars. An essential for decorating Nativity and Christmas scenes. Always useful to have some stars handy to make children's work special. Approximately 1cm in diameter. 12 Sheet pack of Make an Under the Sea Scene. Have lots of fun and let your imagination flow, making your own sea scene. Each sheet has a sea background and lots of dolphin, fish and coral stickers. 50 Pack of Save the Earth Stickers. 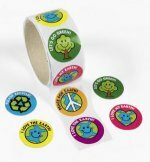 A great bundle of stickers with a variety of simple messages - "I love the earth", "Lets go green", "Peace for earth" etc. Stickers measure approximately 40mm. These crafts and supplies have been carefully selected to provide Bible Classes and Sunday Schools with great value crafts with a message. The majority of the crafts are in 12 unit bags to cater for the larger groups. 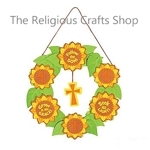 Spread the word, like us..
� 2008-2019 THE RELIGIOUS CRAFTS SHOP All rights reserved.